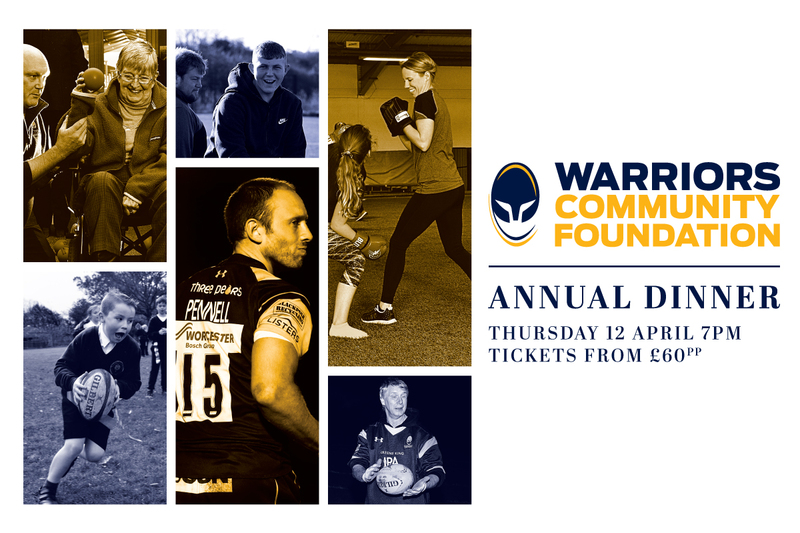 Sixways will be hosting the Warriors Community Foundation Annual Dinner on Thursday 12 April – and you can book your place now. The Annual Dinner has proved extremely popular since its inauguration in 2015 and has raised valuable money for the Warriors Community Foundation over the last four years. Former England cricket captain Chris Cowdrey will be our host for the evening, which promises to be full of fun and entertainment. England Women’s Rugby World Cup winner Maggie Alphonsi MBE will be the guest speaker as she regales the audience with anecdotes from her international career. There will be a three-course meal for guests to enjoy and Warriors first-team players will be on hand to host every table and carve the meat. Guests will also be treated to a Q and A with players and there will also be an opportunity to hear more about the Foundation’s many initiatives. Comedian Ian Irving will take to the stage in the latter part of the evening and don’t forget to charge your phone in preparation for our silent auction in partnership with auction company Going Gone. There is a Lounge Suit dress code for this year’s Dinner, which begins at 7pm in the Ricoh Lounge. Places are available for £60 and can be booked by calling our Events Team on 01905 459342 or emailing events@warriors.co.uk.